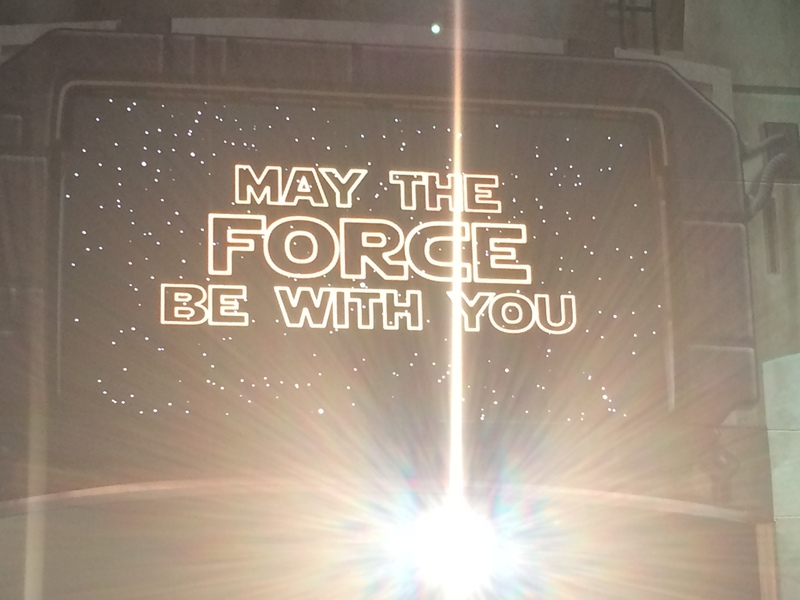 2017 Star Wars Dark Side Half Marathon Event Guide, Corrals, and Waivers are Live! 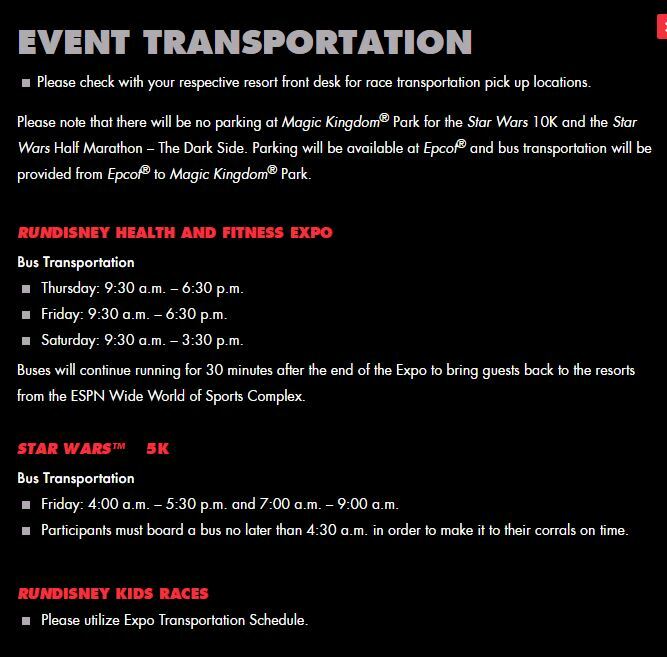 So, on Thursday, runDisney released the 2017 Star Wars Dark Side Half Marathon Weekend Event Guide, Corrals, and Waivers. Normally, I don’t cover the runDisney races which I don’t run. However, I’m thinking about running in the Star Wars Dark Side Half Marathon in 2018. 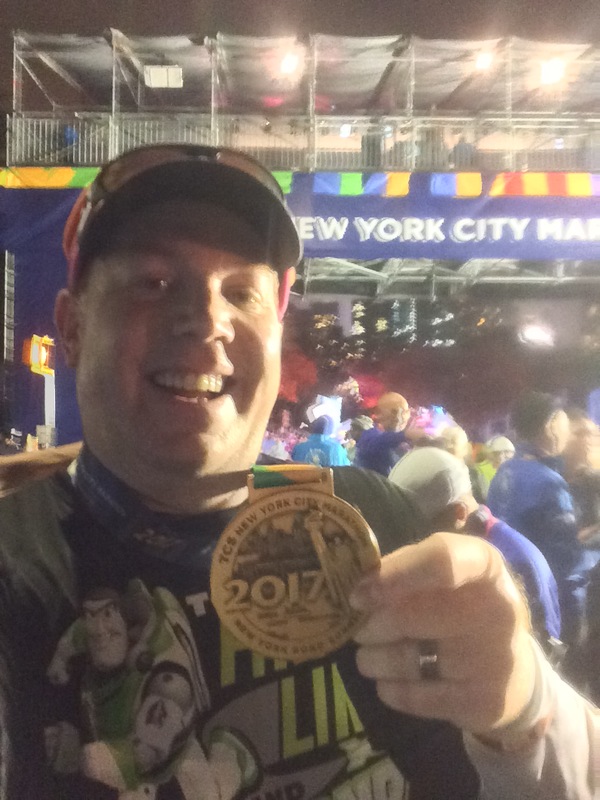 So, I thought I’d take a look to see the differences between the Star Wars Half Marathon Weekends at WDW and Disneyland. You can view the event guide by clicking here. There’s lots of fun information in this digital event guide (which is not the runDisney norm). The bummer about these digital guides is that so many pieces of information that I’m used to cutting and pasting into a blog post, I can’t. Well, I could but it would take more effort than I have time for. One such item is the info about the Expo. Honestly, the maps on this guide are kind of on the small side. If you’ve never been to a runDisney expo at Walt Disney World, you should know that the expo’s tend to be larger than their Disneyland counterparts. They usually have 2 official runDisney merchandise booths. 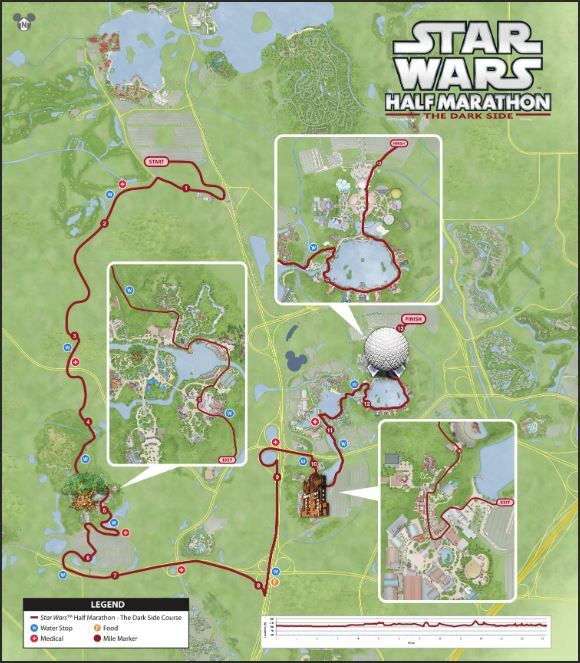 So, check the info about what exhibitors are gong to be at the Expo for the Star Wars Half Marathon – Dark Side online. 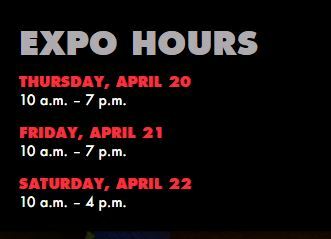 Here are the expo hours for the weekend. One of the big differences between a race at Walt Disney World and Disneyland is getting to the start lines. At Walt Disney World, you will more than likely need to take a bus in the morning. The graphic above represents part of the story for the race. 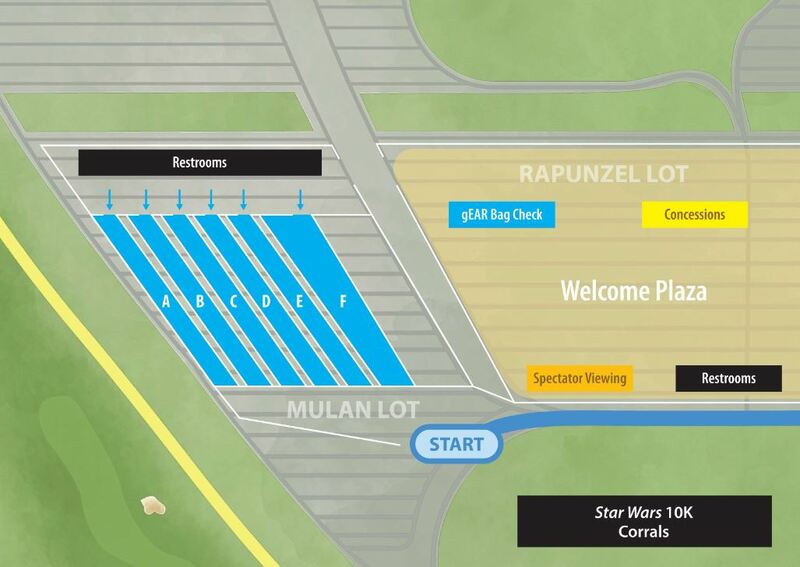 The Star Wars 10K and Star Wars Dark Side Half Marathon will start in the Magic Kingdom parking lot. So, it is important to note that, if you are driving to the start, there is no parking in the Magic Kingdom parking lot. There is information about where you can park if you choose to drive in to the races in the guide. One of the fun things that got released are the maps for each race. 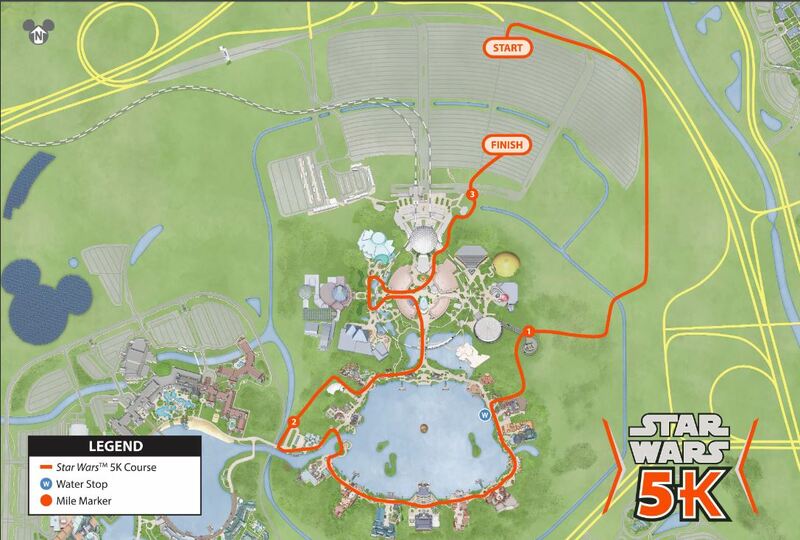 The Star Wars 5K looks like a pretty typical Walt Disney World 5K race. It starts and ends in the EPCOT parking lot. Here’s the map for how the corrals will be lined up. As a regular at the Disneyland races, it’s fascinating to me to look at the different way they line up the corrals at Walt Disney World. All of the races will end in around the same location. So, they all have the same finish area map. 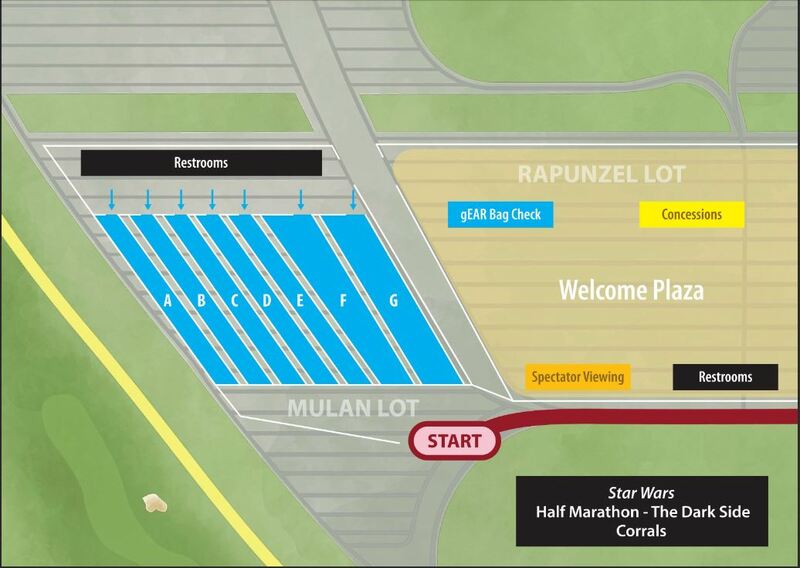 I’m including the Star Wars 5K map only because the 10K and Half Marathon finish area maps look the same to me. 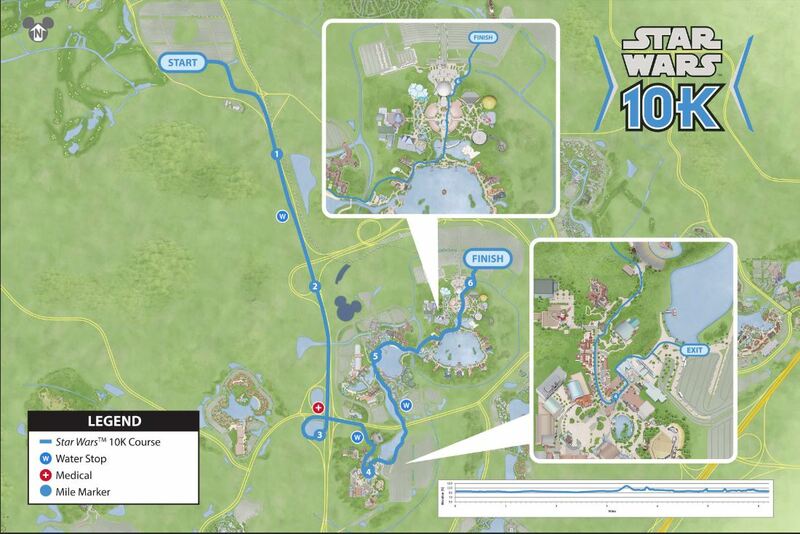 Here’s the Star Wars 10K map. Y’all, this 10K course looks like it will be pretty cool! It’s not the typical Walt Disney World 10K race. You start in the Magic Kingdom Parking Lot and get to run through both Disney’s Hollywood Studios and EPCOT! When I ran the Inaugural Walt Disney World 10K back in 2014, I was pretty disappointed with the course. Over the years, it looked like the 10K course for almost all the races was the same route. This one looks really interesting. Putting all the fun stuff at the end isn’t a bad idea. 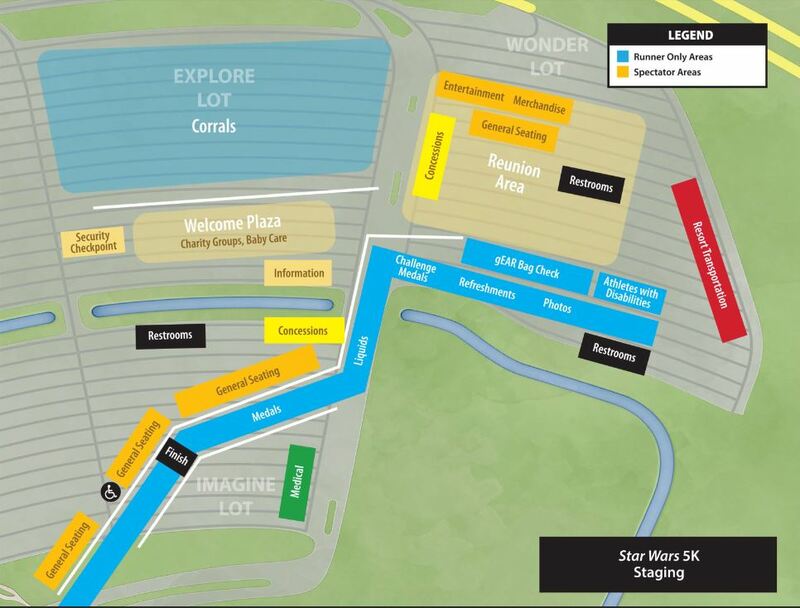 Here’s what the starting area staging will look like for both the Star Wars 10K and the Half Marathon. 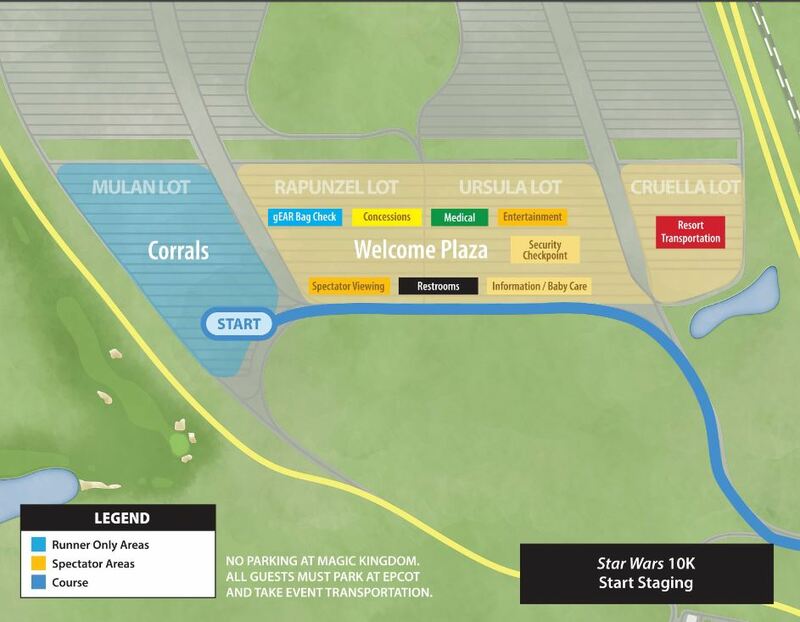 Here is how the corrals will line up for the Star Wars 10K. 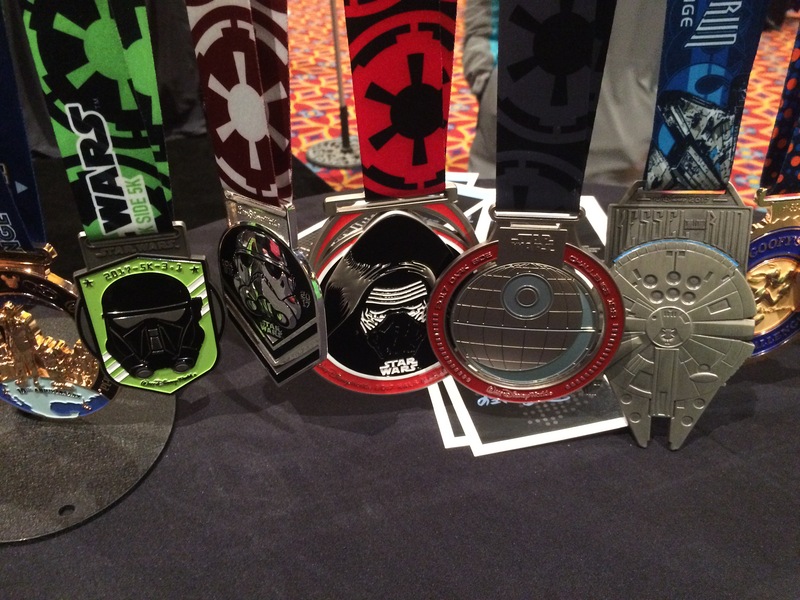 The big race for the weekend is the Star Wars Dark Side Half Marathon. Here’s what the new course looks like. To see a larger version of the map, click here. Just like the Star Wars 10K, this course is brand new. Personally, I like that they will run through 3 theme parks along the way. I also like that they will NOT be running through the ESPN Wide World of Sports Complex. As a person who ran there at the 2014 WDW Marathon, I know it’s not very fun to run around. So, eliminating that part from last year is a definite win for runDisney. Here’s how the corrals will line up for the half marathon. As you can see, there’s one more corral for the half marathon from the 10K. The staging area will be the same as the 10K. How are the corrals seeded? 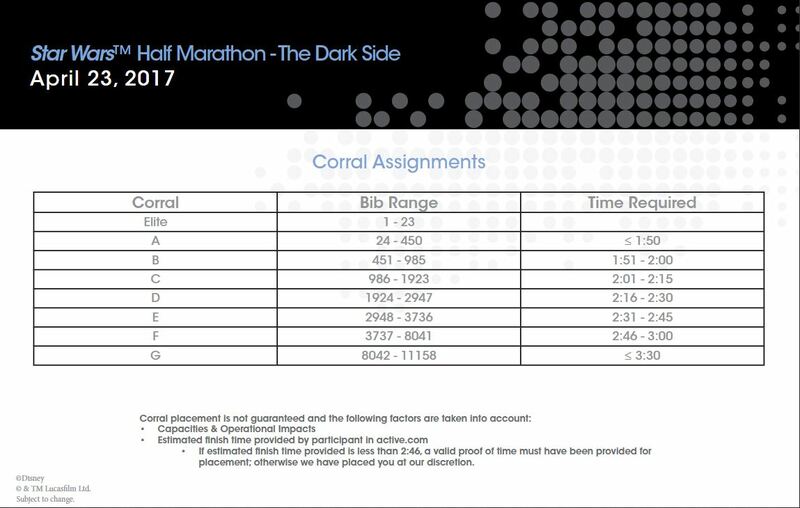 Well, here’s the chart for the Star Wars Half Marathon – The Dark Side. 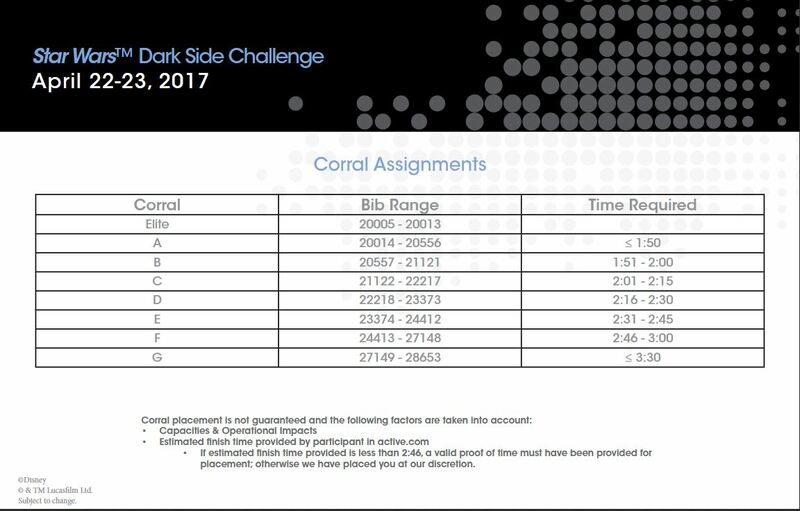 If you’re running the Dark Side Challenge, here’s how your corrals are seeded. Even though I haven’t run a challenge race in WDW, I’m pretty sure that the seeding listed above is for the half marathon. 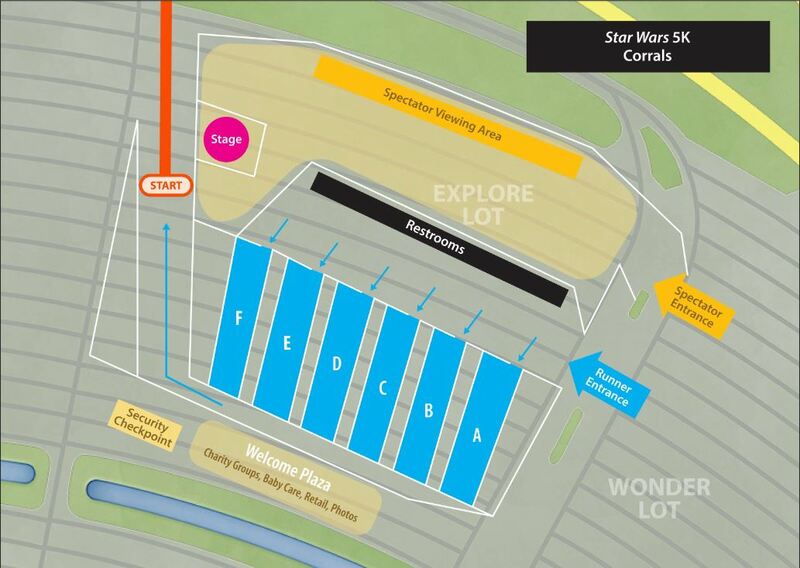 Check your bib to see if you’re in the same corral for the Star Wars 10K as well. If not, the first letter is your corral for the 10K and the second is for the half marathon. To find your bib number, click here for the waivers. By your name, you’ll find the bib number and can use the charts above to see what corral you will be in for the half marathon. Unfortunately, corral assignments are not up for the 10K or the 5K races. So, you’ll have to wait to get your bib before receiving that information. 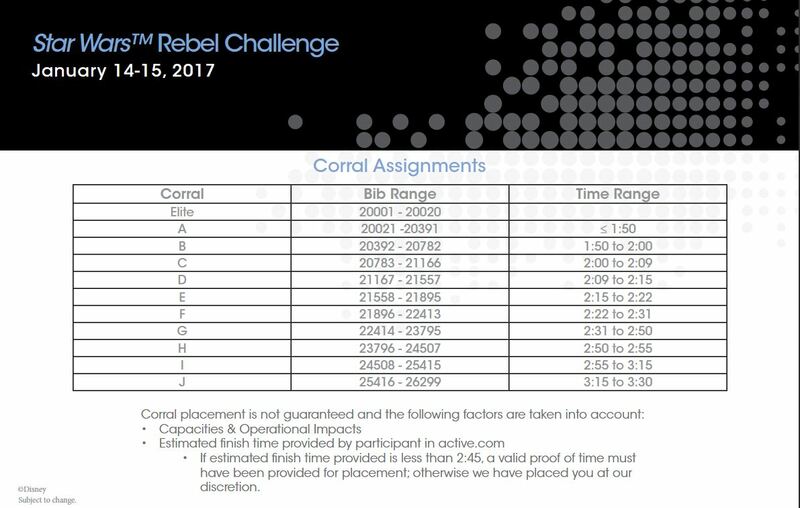 For those interested, check out how the corral assignments went for the Star Wars Rebel Challenge from January. I just thought it might be a fun comparison between the two Star Wars Challenge Races on the runDisney calendar. Good luck to all of you will be heading out to Walt Disney World this April for the 2017 Star Wars Half Marathon – The Dark Side. I hope the event guide helps you get excited and gives you all the motivation you need to finish your training cycles strong!